June in Pond Inlet meant going out on the land. 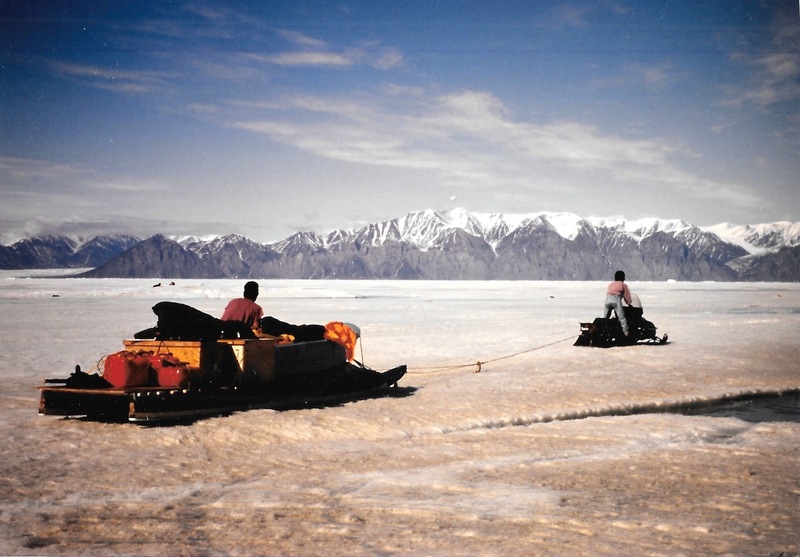 Long wooden qamutik sleds were attached to skidoos, then lashed down with gear. They took off down Eclipse Sound, one by one. Snowmobiling over the ice was wet business. In June 1996, when I was in Pond Inlet for my second visit, this time in late June, we plowed through pools of turquoise water with a thin layer of ice on top. Occasionally a water-filled lead in the ice stopped our progress. When possible, we shot over it on the snowmobile. Other times, we took the qamutik and sent it over the crack first. Heavily-loaded, its back end almost tipped and fell into the water. Finally, after a few hours of travel, approaching the floe edge, beyond Bylot Island, the air turned moist, and while gulls had been flying around, suddenly, there were many other birds. The air was heavy. Steam rose from the edge where water met the ice. Reaching the floe edge was like arriving at the edge of the world. Beyond the ice, blue water seemed to go on forever, to somewhere — or nowhere. At about 8 p.m. on the following evening we were standing outside our tents, talking in the sun. Our faces are slathered in suntan lotion. We camped out only a few steps from the point where salty, slushy water met a thick plate of slowly rotting sea ice. Shadowy mountains in the distance, an expanse of ice and the sky filled the vista, all in shades of blue and white. In Inuktitut, I recalled that blue and green are the same word. Being there was like being at the hub of life, as sun, water, ice, people and animals passed the long days in motion. Camping on the ice, we spotted seals who dipped into their holes in the ice as we approached. Black and white murres sped out like city commuters every morning past the floe edge towards the open water, hordes of them, all in a hurry, and returned in equal haste in the late evening. Not far from our camp, a family set up two tents. Children played in a rowboat pulled up on the ice. A couple of snowmobiles with sleds were in back. It was…a holiday scene on ice. And as we stood there outside the tents, one of my companions became silent. “I hear a narwhal,” he said. There, in the open water I spotted the narwhal’s large, oval shape, gliding by, looking like a log on the water, 2,000 kilometres north of the tree line. Panuli, our guide from the Toonoonik Sahoonik Co-op, was in the cooking tent. “I see a whale!” I ran in to tell him in Inuktitut. Panuli stuck his head out of the tent, but then went back inside, maybe in frustration. Hunters waited for days to see a narwhal within such short range. Panuli had his gun, but he was not allowed to hunt when he was out with a group. I knew he liked to eat narwhal mataaq — he dug up a plastic garbage bag buried in the ice the other night where he stored his country foods and sliced me some. We watched the narwhal as it disappeared, then resurfaced, finally flipping its tail into the air and diving deep below the surface. We never saw its tusk. We didn’t catch up either with the polar bear that left giant paw prints along the floe edge. We saw lots of seals, and occasionally Panuli got out his gun and focus on them, but he never shot. Not cute, he meant, but delectable. Like murre or snow geese eggs. After a long, dark winter, being out on the ice was like wandering in a succulent, frozen garden: We admired the wildlife, Panuli appreciated their taste. We all dined on char, rice and cookies in the tent. With constant sun, our schedule was erratic and a late supper at 10:30 p.m. was not out of the question. I fell asleep later in the tent, then when I woke up — and it was still bright enough to read. I fiddled with my watch, trying to make sense of what time it was, in a place where time really didn’t matter. Outside, wind was blowing off the water and I finally fell back asleep to the sound of crashing ice. The next day found me standing on the top of a ledge somewhere on Bylot Island. In the distance, against a sunny, deep blue sky, was a view of mountains streaked with lines of still-frozen snow. It was totally quiet. The only sound is the powerful beating of my heart. I looked down to the valley below me, at the wide rocky river bed, edged by enormous sandstone forms. Panuli called me to join him at the bottom. The steep slope looked suddenly very scary. “Help me!” I cried to him in Inuktitut. Panuli scrambled up, and hand-in-hand we half slid, half ran down. At the bottom, I measured the full height of those natural, sandstone forms called “hoodoos.” They were towering above me. For the past few days, we’d been talking about coming here — but I thought maybe there was one hoodoo or maybe two, not this hidden valley of giant pillars. I suddenly remembered that we left our companions somewhere on the top of the ledge as we raced along. Panuli went back up, and then, I was totally alone with the hoodoos. Africans used to call these land- form oddities hoodoos because they thought they contained the spirits of animals and evil demons. Hoodoos looked like “stone babies” to Amerindians and “fairy chimneys” to ancient Turks. Looking around, I saw stars at the top of hoodoos, crosses and crescents, the bulbous, onion-shapes of Russian Orthodox churches. I saw a narwhal and what looked like the rounded haunches of a Stone Age fertility goddess. All the deepest, most universal shapes of humankind seemed to be reflected in these wind-carved shapes. The sun shone out from behind the line of hoodoos, casting long shadows along the valley floor. The return of Panuli with the others did little to end my reverie. Icy river water coming from the mountains moved quickly over the rocks, like music, drowning our conversation. I finally climbed back up, stopping for a last view over the valley before beginning the hike back to our camp. 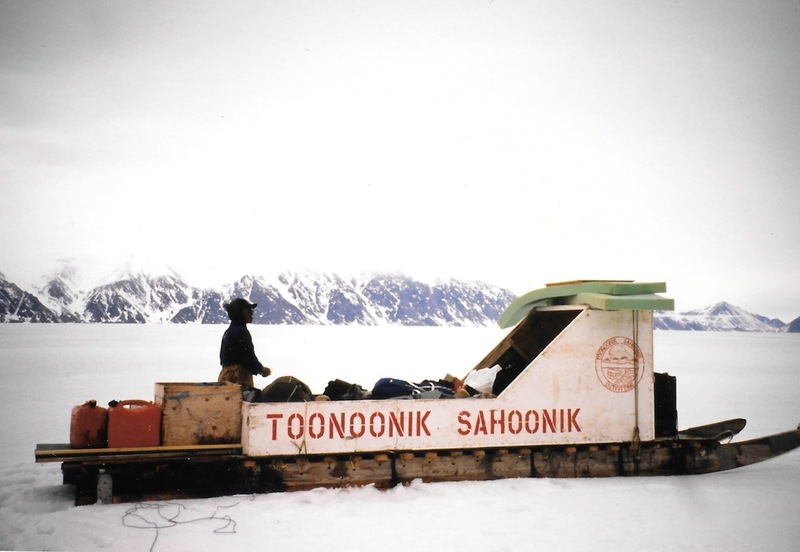 We’d set up camp on the ice, not far from a smaller group of hoodoos, many inscribed with Inuktitut syllabics. “Matteusi,” a common boy’s name, was etched into one. I sprawled on the shore on the buoyant cushion of tiny Arctic willows that covered the ground. Small purple flowers surrounded us, while a snow bunting chirped not far away. I looked over Eclipse Sound, to the thin, blue-white line of mountains in the distance. I experienced the same perfect feeling looking down from the top of Mt. 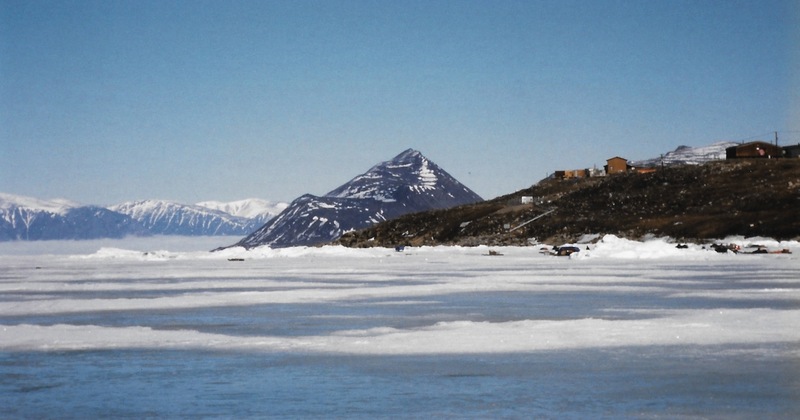 Herodier, a few kilometres outside Pond Inlet. After climbing up steep, rocky slopes, we reached the summit, marked by a small cairn. The view took in Bylot Island, rugged cliffs to the other side and a dizzying descent to the frozen surface of Eclipse Sound. The huge cracks in the ice that we crossed to get here looked small. Midway down, we stopped, sitting in silence in the sun. A stream had opened under the rocks and we listened to the water. Tiny yellow flowers were opening up between the rocks, and last year’s Arctic cotton, with soft tufts like dandelions, was emerging from the quickly melting snow. A slight smell of moss was in the air. Below us, a vast beach of rounded stones, left by an ancient glacial river. Many were piled into traditional Inuit graves at the bottom of the mountain. At that moment, I was glad to be alive. The next blog instalment of “Like an iceberg” goes live May 1. Missed the first part of “At the edge of the world”? Read it here.